Home » Yesterday » Doubleday didn't invent baseball...so who did? Doubleday didn't invent baseball...so who did? Union prisoners play baseball in Salisbury, N.C.
You may think you know baseball’s history: Abner Doubleday, Civil War hero, was the inventor of the great American pastime. Right or wrong? That story, as it turns out, is a myth. Here is the rundown, along with links for further study. How did Abner Doubleday (1819-1893) become associated with the sport? It all started in 1903, when British sportswriter Henry Chadwick wrote an article speculating that baseball was probably based on the British game called rounders, a National Public Radio article explains. Albert Spalding, a baseball executive and founder of Spalding sporting goods, disputed this. The two men appointed a commission led by Abraham Mills, president of the National League of Professional Baseball Clubs. During the search, "Abner Graves, a mining engineer, proclaimed that Abner Doubleday -- a decorated Union Army officer who directed the first shot at Fort Sumter at the start of the Civil War and later served at the Battle of Gettysburg -- invented baseball in 1839 in Cooperstown (New York)," recounts the National Baseball Hall of Fame and Museum website. The commission accepted this conclusion, but it was later debunked. For one thing, Doubleday was at West Point in 1839. And the website History.com describes Doubleday as a "bookish man who was not known to participate in athletics." So, why on earth would someone say Doubleday invented the sport when he didn't? For one thing, Doubleday was a noted Union officer during the Civil War. He would have been well known at the time. If it's any comfort, Doubleday mentioned baseball on at least one occasion, according to the Society for American Baseball Research: "In 1871 Doubleday was in Texas, where he commanded the all-black 24th Infantry Regiment. This is where Abner Doubleday and baseball were linked for the only time. Doubleday asked his superiors to 'purchase baseball implements for the amusement of the men.'" Nevertheless, the baseball field in Cooperstown is called Doubleday Field, and the town is the home of the National Baseball Hall of Fame and Museum. As put on the website: "the facts alone do not deter the spirit of Cooperstown." So, if Abner Doubleday didn’t invent baseball, who did? The earliest reference to it was in a book published in 1744. Baseball, in some early form, was probably played by Americans even in the 18th century. How did tbaseball become widespread -- America’s pastime? At the Salisbury Confederate Prison in North Carolina, Union prisoners played. “Diaries document the detainees’ daily routines and pastimes. 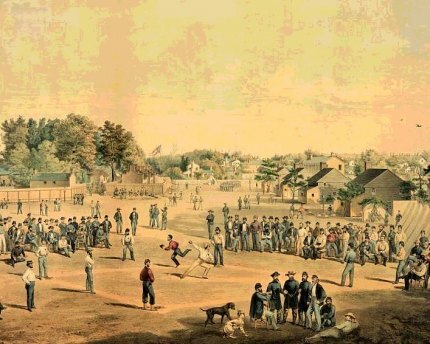 Prisoners from the first half of 1862 noted that baseball games were played nearly every day, weather permitting,” the museum’s website recounts. When did teams wear uniforms and use gloves? As early as 1849, The Knickerbocker Baseball Club of New York adopted a uniform: blue woolen pantaloons, white flannel shirts and straw hats, according to the Baseball Hall of Fame in Cooperstown. They ditched the straw hats a few years later, but the colors were retained. Fielding gloves came about in the 1870s, according to John Thorn, the official historian of Major League Baseball, interviewed on the National Public Radio website. Library of Congress: Baseball Americana. National Baseball Hall of Fame and Museum: Website. National Baseball Hall of Fame and Museum: Dressed to the Nines, A History of the Baseball Uniform. National Public Radio: The Secret History of Baseball's Earliest Days. Smithsonian National Museum of American History: Civil War baseball. Society for American Baseball Research: Abner Doubleday.